Melissa Hayden, famed New York City Ballet dancer and one of George Balanchine’s finest, was my teacher when I attended the University of North Carolina School of the Arts. I can’t help chuckling as I remember her telling me that she always carried a male dancer’s dance belt in her dance bag. This was in case her male counterpart forgot his. NOTHING would stand in her way of a rehearsal or performance – not even an unprepared partner! That memory got me thinking, what’s in your bag? Let’s take a look at some head-to-toe trends for fall 2013 and some must-have items for your dance bag as you head back to school. Girls seem to be side-parting the hair and throwing in a braid or a twist to the ponytail before constructing the bun. Keep some tasteful sized hair bows, flowers and headbands in your bag to finish the look. Making your hair as neat as possible will display your preparedness and commitment to your time in the studio. For the male dancer, keep the hair short and conservatively shaped. Don’t be scared to try gel from time to time (a MUST for performance). At CPYB leotards are expected to be modest and of a traditional style. Lovely leotards can still be found with velvet trims, innovative fabrics and finishes, and some interesting strap detail. Wear Moi (http://www.wearmoi.com) and Yumiko (http://global.yumiko-online.com) leotards seem to be the brand front-runners. Tights are really a matter of preference. The convertible footed tights are a huge hit and enable one to still wear their favorite flip-flop or sandal. There’s not much trend to speak of for the gentlemen, but my advice would be to keep the t-shirts clean and fitted. With no holes! The same goes for the tights and socks. Between you and me, gentlemen, you need a great dance belt that fits. You’ll spend many hours in it and you don’t want to be uncomfortable or find yourself, well, distracted. Go with a dance belt that has a higher percentage of stretch in it and is quilted on the inner side. Oh, and unlike Melissa Hayden, I wouldn’t expect your partner to pack one for you! As far as warm ups are concerned, I have seen a departure of sorts from actual dancewear into the popular Lululemon athletic gear (http://shop.lululemon.com). For both male and female, their apparel and fabrics possess many features that work perfectly for an active dancer – anti-stink yarns, chafe resistant, four-way stretch, moisture wicking and quick dry. Shoes aren’t much of a trending category. You like what you like and what works for your foot. Dancers seem to still prefer the booties though for warm up – the nylon with down or knitted versions. 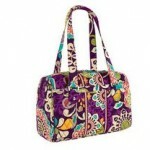 Today Vera Bradley (http://www.verabradley.com) is all the rage! The quilted and brightly patterned bags are everywhere. There are many colors, shapes, and patterns to choose from and it appears as if the functionality is high. A pocket for this a pocket for that, everything has its place and stays quite organized. I very rarely see male dancers carrying their bags into the studio. They don’t need the toe tape, toe pads, change of shoes, etc., that women need ON them at all times. Still in need of carrying their clothes, shoes, snack, water, etc.? I believe that bags by Dakine (http://www.dakine.com) have great quality, functionality and style. To get your body going for the day, massage in addition to stretching and warming up are a must (ahem – especially the older we get!). The Stick (https://www.thestick.com) is a great rolling massager. It comes in different lengths as well as different strengths. Foam rollers, great for assisting in stretching as well as massage, can be found at several locations. They vary in texture and firmness. Whew! That’s a lot of trends for you to consider as you head back to school. Each of these items is a product that I’ve heard dancers have been satisfied with. All known for their high quality, great fit and unique design elements, these products simply stand out. I’m sure you’ll find many more that live up to your expectations and certain needs, finding them not only online but in stores in your communities. Enjoy! In the meantime, here’s a simple overview of items that should be in your bag. So, what’s the one thing in your bag you can’t do without? Writer’s Note: If you’re joining us at CPYB for the 2013-14 academic year, be sure to also check out 360 Dance Fitters on High Street in Carlisle. 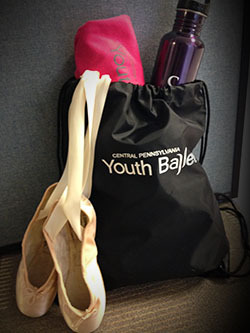 My dancer isn’t at CPYB, but these are great tips for all dancers (and their moms!). I like the bun with the braid. I’ll definitely show that to my daughter. I like Vera Bradley bags as dance bags and I shared a little bit about that at http://www.squidoo.com/vera-bradley-bag-for-dance. This is only the second time I’ve read somewhere about The Stick for dancers. I’ll have to look into that more. Thanks.